By accessing our Websites or social media sites, you accept the terms of this PrivacyPolicy. Our Websites are not intended for children under 13. No one under 13 may provide any information on our Websites. We do not knowingly collect personal information from children under 13. If you are under 13, do not use or provide any information on the Websites, register on the Websites, make any purchases through the Websites, use any of the interactive or public comment features of the Websites, or provide any information about yourself to us, including your name, address, telephone number, e-mail address. If we learn we have collected or received personal information from a child under 13 without verification of parental consent, we will delete that information. If you believe we might have any information from or about a child under 13, please contact us at organic(at)organicvalley.coop. We collect information you voluntarily give us as well as information collected automatically. This includes personally identifiable information such as your name, postal address, e-mail address, photograph and financial information (when you buy products). You voluntarily provide this information when you fill in forms on our Websites, subscribe to our newsletters, register as a user or Farm Friend, enter a contest or promotion, respond to surveys, place purchase orders, make coupon requests, print coupons, or make coupon redemptions. You also may post comments via an on-line forum, offer recipes, respond to surveys, state preferences ("User Contributions"). Please be aware that your User Contributions posted on our Website are available for the public to see. If you post personal information when you interact on our social media sites, depending on your privacy settings, this information may become public on the Internet. We are not responsible for personal information you choose to post publicly on interactive portions of the Websites or our social media sites. When you access our Websites, we may use automatic data collection technologies to collect certain information about equipment used, browsing actions and patterns, including traffic data, location data,logs, the resources that you access and use on the Websites, information about your computer and Internet connection, including your IP address, operating system and browser type. We also may use these technologies to collect information about your online activities over time and across third-party websites or other online services. Web Beacons. Pages of our the Websites and our e-mails may contain small electronic files known as web beacons (also referred to as clear gifs. pixel tags and single-pixel gifs) that permit us, for example, to count users who have visited those pages or [opened an e-mail] and for other related website statistics such as recording the popularity of certain website content and verifying system and server integrity. Targeting Cookies. When you click on “Share”, “Like”, or “Tweet” button that may be found on certain web pages of our Websites and which are linked to services provided by third parties such as YouTube, Vimeo, Flickr, Facebook, Twitter, and others, certain cookies may be generated by such third parties and shared with advertising agencies. We do not control the setting of these cookies nor the cookie data sent by your browser to third parties. Such data is not accessible to us. For more information about these cookies please check with these third party websites. Google Analytics. Our websites use Google Analytics to help analyze how users use the site by placing (i) cookies which are text files that collect standard Internet log information and visitor behavior information in an anonymous form, and (ii) a Double Click cookies which enables additional data collection based on Display Advertising. The information generated by the cookies about your use of the Websites (including your IP address) will be transmitted to and stored by Google on servers in the U.S. and other counties. Google Analytics collects information anonymously. It reports website trends without identifying individual visitors. You can opt out of Google Analytics without affecting how you visit our site – for more information on opting out of being tracked by Google Analytics across all websites you use, visit Google ad settings. Social Media Sites. If you engage with us through social media sites, or though features of our Websites that integrate with social media sites, you may allow us to have access to personal information and other information from your social media account. To improve the Websites and your user experience. To share information about you with social media networks to allow for the delivery of customized advertising about products and services that you may be interested in. The delivery of customized social media ads, and your ability to opt-out of receiving those ads, is governed by the privacy policies of the social media companies who deliver customized ads to you. We may disclose aggregated non-personally identifiable information to third parties. To our subsidiaries or affiliates. If we believe disclosure is necessary or appropriate to protect the rights, property, or safety of CROPP Cooperative, our customers or others. This includes exchanging information with other companies and organizations for the purposes of fraud protection and credit risk reduction. To repair our equipment, or the Websites. At any time if you do not want to receive e-mails or other materials from us, you may opt-out, by sending an e-mail to our consumer relations staff, organic(at)organicvalley.coop. If you sign-up for one of our newsletters, you may unsubscribe by clicking the ‘unsubscribe’ link in each communication. You may send us an e-mail to organic(at)organicvalley.coop, requesting that we correct or delete any personal information that you have provided to us. We may not accommodate a request to change information if we believe the change would violate any law or legal requirement or cause the information to be incorrect. If you delete your User Contributions from the Websites, copies of your User Contributions may remain viewable in cached and archived pages, or might have been copied or stored by other Website users. We have implemented measures designed to secure your personal information from accidental loss and from unauthorized access, use, alteration and disclosure. Unfortunately, the transmission of information via the Internet is not 100% secure. While we cannot guarantee the security of your personal information transmitted to our Websites, we will take all reasonable steps to safeguard this information once we receive it. You will begin receiving updates from us in a jiffy! Follow us to see a Mighty world. Like us to join the Mighty life. Where to buy Mighty near you. 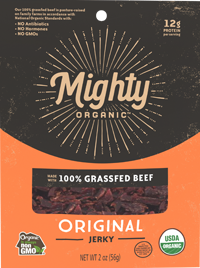 © Mighty Organic 2019. All rights reserved.